Bakelite is an early plastic, created in 1907. It contains phenol, formaldehyde and a wood flour filler. When the phenol and formaldehyde are mixed together, the reaction of the the chemicals under the correct pressure and temperature creates this amazing, hard plastic. In the case of jewelry, the Bakelite was extruded, sliced, molded or carved to create the shape of the piece. Many Bakelite pieces are kept in cases, behind glass so you can give it a good look-over before bothering someone to unlock the case. 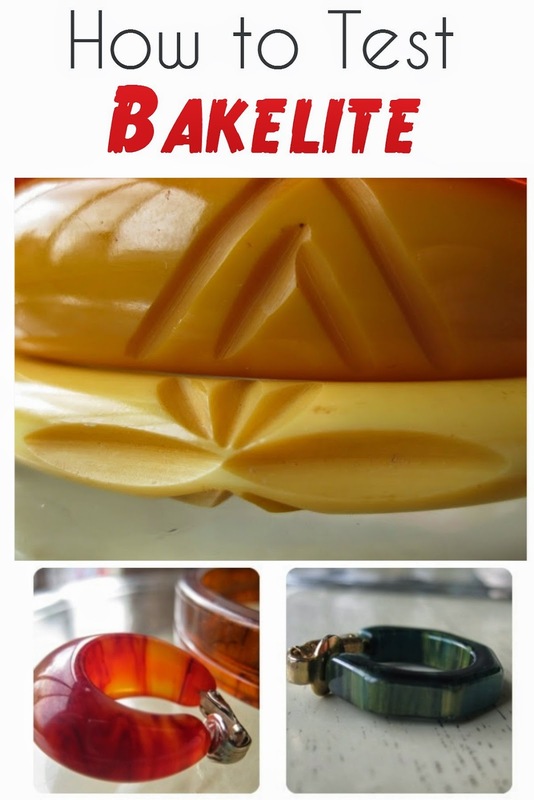 A visual inspection is the only thing you can do when buying Bakelite online. Check for Seams- Checking for seams is the first test I do when looking at a bangle. 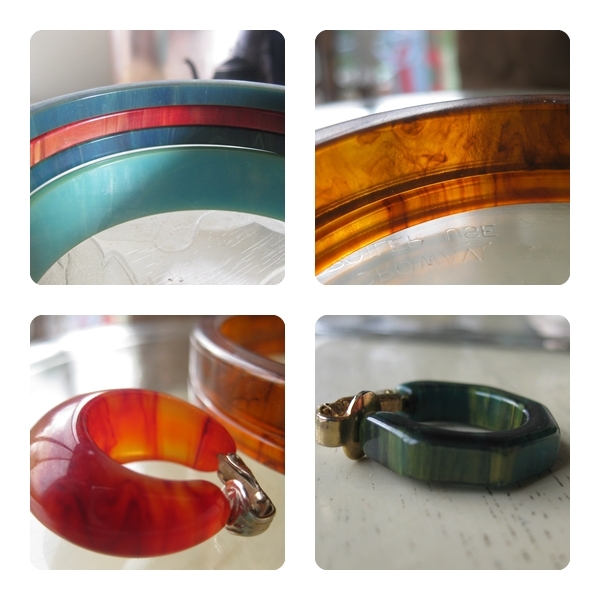 Bakelite bracelets should not have any seams on the inside of the bangle. Of course, there will be exceptions to the rule if the piece is made of different colors stacked together, like these green and black earrings. Inspect Hardware- if buying a brooch, the pin back will be embedded into the Bakelite or riveted on, not glued. In the case of new brooches made using Bakelite findings, the pin back may be glued on. I also have a few pairs of Bakelite earrings with the clip-on earring back glued on. Chips and Wear- Bakelite that is carved may have small chips along the carving and scratch lines inside of the carved space, which is evidence of the tool used to create the design. If the carving lacks scratch lines, it may be a modern reproduction. It is not uncommon for older Bakelite pieces to have a small chip. In fact, a chip may help you to reveal the identity of the plastic. If the piece has a chip or scratch, the color of the plastic revealed from the damage will be the same as the surface color. In my recently purchased fake bangles, one of the bangles had a scratch which, revealed a white plastic under the surface, a tell tale giveaway. On the Surface- Bakelite has a very distinctive shine. It reflects light but is not too glossy. The surface should be extremely smooth. In online photos, the surface can be difficult to determine due to camera flash and unclear photos but any pock-marks or lumpiness in the surface will sound alarms. Fake Bakelite or "fakelite" sometimes has a chalky coat , which does not occur on Bakelite. Below is an example of the marbling, shine and translucency of Bakelite versus other plastics. The bangle is real and the earring is modern plastic. Colors and Marbling- the colors of Bakelite are usually obvious but on occasion, there are odd shades that pop up. Bakelite comes in various shades of red, green, black, butterscotch, cream, orange, brown, root beer (brown translucent swirl), apple juice (translucent pale yellow) and my favorite-blue or turquoise. Some Bakelite pieces are a mixture of colors swirled together, like this yellowy green "creamed spinach" or this swirled red. In any marbled piece, there should be vertical lines on the inside of the bangle. This root beer bangle (top bangle on the right) is pretty swirly on the inside but still has a general vertical pattern. after you get to touch the piece, you can really begin the investigation. Weight- Bakelite tends to be heavier than modern plastics, Lucite and celluloid. Familiarizing yourself with the proper weight of a piece and to compare it to other Bakelite jewelry items will make a world of difference in your Bakelite hunting adventures. If it feels very light, try some of the other testing methods. Texture- as mentioned above, Bakelite is generally very smooth. There are odd cases when it comes to a very worn, old piece or bangle that is heavily carved. Bakelite should not be lumpy to the touch and if you run your fingernail across the piece, your nail should slide with ease and it should not be grainy. Sound- One thing I really love about wearing Bakelite is the clack noise when they tap together. This is another way to test the authenticity of the plastic. It should be a heavy, low-pitched clack. The size and weight of the items will create a different sound so this method isn't as reliable and should always be used with other tests. It is fun and interesting to try and has really helped me to identify Bakelite. Smell- the rub and sniff is my tried and true method of choice and is very handy if you don't have any chemicals around to test it. Rub the piece with your thumb until it becomes warm and give it a sniff. If it is Bakelite, it will give off the chemical scent of formaldehyde. This test has worked on every piece in my collection, although some older pieces or black jewelry needs a bit more rubbing before it works. Some pieces give off a stronger scent than others. The smell test doesn't work for everyone so don't be disappointed if your nose can't detect the smell, it may still be a genuine piece of Bakelite. You can also do this test by running it under hot water for a few seconds. If you do use the rub and sniff, be careful. I don't know how many thumb blisters I've had from rubbing loads of plastic over and over! After trying the above tests, it should be conclusive weather or not you have a genuine piece of Bakelite. I have never needed to use chemicals to test my Bakelite but if you want to give it a try, here's how! Please note that you should always ask permission before using chemicals on a dealer's goods. Always test the piece on the inside of the bangle, back of an earring or any inconspicuous area. The chemicals should be rinsed off right away. Simichrome- Simichrome is a metal polish that comes in a tube and a tiny bit goes a long way! Get a little bit of Simichrome on a q-tip and gently rub the surface of the piece. If the piece is Bakelite, the q-tip will turn yellow. This method may not work on heavily lacquered pieces or on black Bakelite.I asked the gals on my facebook page about Simichrome last week and they all confirm that they have never had a piece of fakelite test positive with Simichrome. 409-an all purpose household cleaner, used the same way as Simichrome. The cotton swab should turn yellow if it is genuine. Scrubbing bubbles was once used to test Bakelite but it has been found to strip the surface of the plastic. The hot pin test is also a possibly damaging test in which a pin is heated till red and pressed into the plastic. If it is Bakelite, it shouldn't melt but it's not worth attempting. If it fails to pass the test, it probably is not Bakelite but that doesn't mean that it's worthless. There are loads of beautiful Lucite, celluloid and other vintage plastics to collect or wear just because you like them. Celluloid and Lucite can be just as collectible as Bakelite. Some collectors might shoot me for saying so, but I think fakelite is pretty awesome. If you can get it for a dirt cheap price, you get the look of the real deal for less! Many costume jewelry stores carry plastic bracelets, necklaces and earrings that look a lot like Bakelite. I bought each of these Bakelite look-a-likes for $1! Etsy and eBay have lots of beautiful Bakelite pieces, but buying online can be scary business sometimes. There are lots of reputable dealers out there so my best advice is to read descriptions thoroughly, inspect the pictures with a close eye and ask questions if in doubt. When buying in person, check flea markets, estate sales, garage sales, vintage fairs, antique shops, resale stores and rummage sales. I think the best find still goes to my best friend, Amanda, who found a bakelite spacer at a clothing resale shop for a quarter! Stick your tube of simichrome in your purse, keep a watchful eye and may the best gal find the treasure! Also be sure to check out my e-book, Pins for Pin-Ups: DIY Brooches for Retro Girls for 12 vintage brooch projects, including a bakelite-inspired cherry brooch! Oh you're too lovable! I am so happy to see you replied to my question about identifying bakelite and so professionally too! love your pictures. and all your hints are precious - can't wait to test my own plastics now! thanks a million for sharing your knowledge! What a great post, thank you! I have always been a little confused about bakelite. Very helpful indeed! I think you wrote a similar post awhile back, but when I try rubbing the bangles the store clerks (Goodwill) look at me weird, so I have been too embarrassed since. I will have to give it another try though, cause you have such a lovely collection! I've given up buying bakelite bangles online. I need the 2-3/4" size (the largest made?) and NO ONE on ebay or etsy knows how to correctly read a measuring device apparently. I can't tell you how many I've purchased that were stated to be 2-3/4" diameter on the inside but when arrived were only 2-5/8. It's like everyone thinks the first notch after the "1/2" mark is 3/4! Drives me crazy. But your collection is beautiful! Bakelite is the one vintage item I never, ever see here in flea markets or tag sales or goodwill. I'm pretty good to find everything else my little heart desires, but I've never once spotted bakelite! This is a great and very informative post - I'll link it on my blog tomorrow! I don't have any bakelite, I'm a fan of clear lucite - shoes and purses from the fifties. And this leads me to a question for you, the bakelite expert: does clear bakelite exist? I don't think so, but I've seen clear purses being called bakelite on the internet. I think I'll make Pinterest boards for these pages too. Sanne, I am So envious of your gorgeous collection! It's amazing. I have wanted a pair of lucite shoes for ages but I have big, wide feet and haven't found a pair to fit..yet! :) From what I've read, clear bakelite does exist. They call it "prystal". It should have the same characteristics of the above bakelite, but should be completely translucent. The only prystal bakelite that I have come across as been the yellow "apple juice". There are some bangles on etsy claiming to be Prystal but I haven't been brave enough to buy one yet :P I found more information on prystal bakelite here: http://www.angelfire.com/ca3/gale/ some bakelite collectors consider the root beer (swirled amber and brown) to be prystal too. As for the purses, I'd be cautious about them. They are probably lucite and the seller doesn't know much about them but you never know, there may be some bakelite purses out there! Im curious if you could maybe give estimates on what to pay for Bakelite? I was at a flea market and saw bangles priced at $35. I wasn't sure if that was too much. Maybe you could share whats too much for bangles, earrings, brooches, etc. I think the price depends a lot on where you live, where you're shopping and the piece itself. I"m in the midwest US so bakelite is pretty affordable here but in the UK, I hear that a single bangle can be hundreds of dollars and up. At a flea market, estate sale, garage sale and some antique malls, I expect bakelite to be more affordable than a trade show, high end antique shop and vintage store. Carved pieces and popular colors like apple juice, red, green and blue are usually higher than butterscotch and odd marbled colors. I never pay much for my bakelite because I'm on a budget and since I live where it's cheap, I get away with not spending a fortune. My bangles range from $1-$40. The $40 one was an online purchase because it was carved and a unique orange color. $35 for a bangle isn't a bad price, as long as it has some thickness to it. I wouldn't pay that much for a super skinny spacer unless maybe it was heavily carved or blue (my favorite color). Good luck!! Perfect!!! I live in NYC, where everything is overpriced. Thanks for the help B!!!! Wow, this is so informative. Now, off to check all my "plastics". Thanks!! I've tried to get an answer in my books about Bakelite jewelry but without luck. Thanks for this post. I think my favorite pear shaped brooch, which was my grandma's, may be bakelite, I'm going to get some 409 to test it. Thank-you for this very informative guide. I read on many sites about the clunking sound and also some say clanking. I am looking for an 'audio bite' of what that sounds like ~ so far nowhere to be found! ~ , I have some spacers( pass smell test-cant get simichrome in Canada) that I hear a clunking with but would really like to have an idea of real bakelite sound when I'm out and about.. Would you consider doing an audio bite? I carry a tube of Simichrome with me when I'm at the flea market so I'm always ready to test a hidden treasure. But it's very difficult to make transparent color. Do you have any information about this?